NEW YORK  Deloris Gillespie was a fun-loving, fast-talking mother of four who helped anyone she could in her Brooklyn neighborhood and at the post office where she worked for years. Suddenly, in a few fiery moments in an elevator  her life was snuffed out. On Monday, with a suspect behind bars charged in her murder, "I can't believe she's gone!" said Violet Young, a former colleague from a Brooklyn post office where Young said they both had worked. "I saw her two weeks ago at the bus stop, and she gave me her cellphone number." Flower bouquets and candles graced the entrance to the six-story apartment building where the 73-year-old woman lived, on a quiet street in Brooklyn's Prospect Heights neighborhood lined with brownstones. Gillespie worshipped at the Brotherhood Baptist Church a few blocks away, true to her Southern roots. Her funeral is planned for after Christmas, according to City Council member Letitia James, speaking on behalf of the family, who she said has requested total privacy. Gillespie leaves one daughter and three sons, according to James. She was also active in community affairs, helping organize celebrations including those for Martin Luther King Day. And she would attend community council meetings to try to keep crime out of a neighborhood that is becoming highly gentrified, with younger professionals moving into buildings like the one on Underhill Avenue where Gillespie lived since the 1960s, neighbors said. "She was a funny person, and she made people happy," said Young, adding that Gillespie worked nights, sorting mail at a postal facility in Brooklyn's East New York neighborhood. The U.S. Postal Service did not immediately return calls inquiring about Gillespie's employment, nor did the American Postal Workers Union. The man accused of killing Gillespie, Jerome Isaac, was often seen at her apartment last year doing odd jobs, coming and going at various hours, said Jaime Holguin, who lives on the same floor as Gillespie. Holguin, the manager of news development for The Associated Press, said he saw surveillance pictures of the attacker and was certain Isaac was the man who had worked for Gillespie. Early this year, he stopped coming to the building, Holguin said. Isaac told police he set her on fire because she owed him $2,000, authorities have said. She reportedly believed he was stealing items from her home. On Saturday afternoon, police said the 47-year-old man sprayed gasoline on her before setting her ablaze in the elevator of her apartment building. 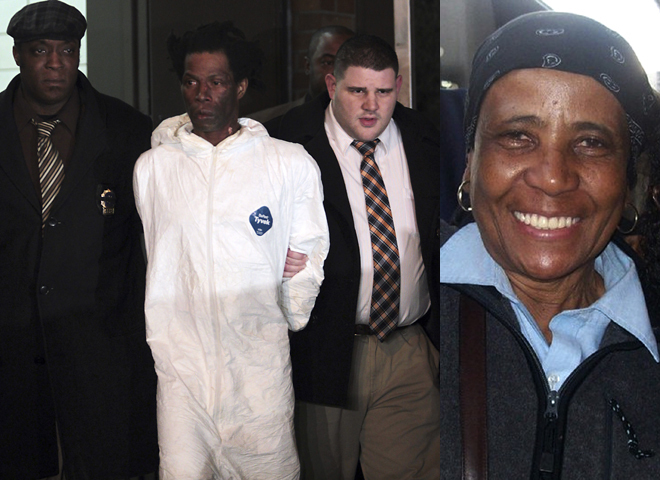 Isaac was arraigned Monday in Brooklyn criminal court, charged with murder and arson. He appeared in court with the left side of his face blistered and burned, his upper lip swollen. He's being held without bail in Gillespie's death. His lawyer requested solitary confinement and medical attention but did not speak outside court. Gillespie's last moments were ones of torture inside the elevator she took with the last groceries she would ever buy. According to the criminal complaint, Isaac doused her with gasoline as the elevator opened to the fifth floor. She crouched and cowered, with the grocery bags draped off her arms. Isaac then pulled out a barbecue-style lighter, authorities said, and used it to ignite a rag in a bottle. He waited a few seconds as Gillespie huddled on the floor. Then he backed out of the elevator and tossed the flaming bottle in, authorities said. Gillespie died of burns and smoke inhalation.